The Supreme Court on Thursday, by a 2:1 majority, refused to refer the Ayodhya-Ram Janmabhoomi land dispute case to a larger bench. 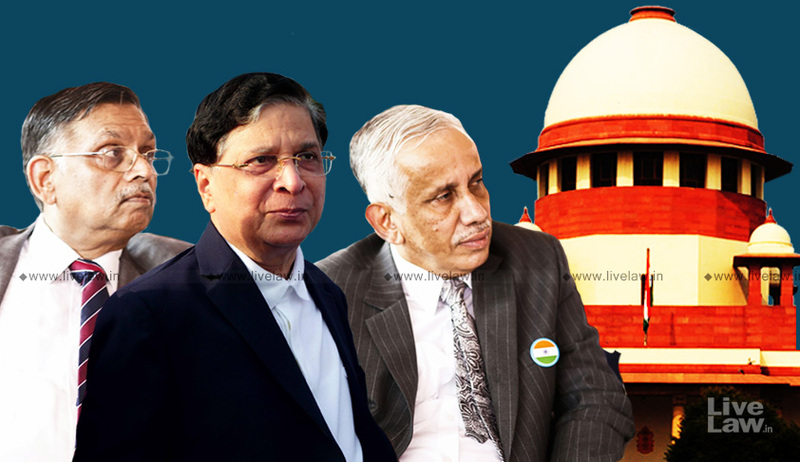 While the majority judgment was authored by Justice Ashok Bhushan, for himself and Chief Justice of India Dipak Misra, Justice S. Abdul Nazeer delivered the dissenting opinion. The majority judgment clarified that the observations made in the Dr. M. Ismail Faruqui and Ors. Vs. Union of India and Ors. judgment, that mosque was not an integral part of Islam, have to be understood in the context of land acquisition proceedings. The appeals have now been directed to be listed in the week commencing from October 29 for hearing. The Constitution Bench in Ismail Faruqui case was deciding on several challenges to the validity of the Acquisition of Certain Area at Ayodhya Act, 1993, by which the Centre acquired 67.703 acres of land in Ayodhya, including the plot where the structure commonly known as Ram Janam Bhumi­ Babri Masjid was situated . One of the grounds on which the attack was mounted on the legislation was that the legislation was anti­-secular and against the Muslim community. Representatives of the community had argued that a mosque has immunity from State's power of acquisition, and had asserted that a mosque cannot be acquired because of its special status in the Mohammedan Law. It had also been contended that the acquisition of a mosque violates the rights guaranteed under Articles 25 and 26 of the Constitution of India. After examining the law in British India, prior to 1950, and the law after enforcement of the Constitution, the Constitution Bench had come to the conclusion that places of religious worship like mosques, churches, temples etc. can be acquired under the State's sovereign power of acquisition. It had ruled that acquisitionper se does not violate Articles 25 and 26. The Constitution Bench had further held that the right to practice, profess and propagate religion guaranteed under Article 25 of the Constitution does not necessarily include the right to acquire or own or possess property. Similarly, it had asserted that this right does not extend to the right of worship at any and every place of worship. With such observations, the Constitution Bench had held that offer of prayer or worship is a religious practice, its offering at every location would not be an essential or integral part of such religious practice unless the place has a particular significance for that religion so as to form an essential or integral part thereof. The majority judgment, however, now pointed out that the sentence “A mosque is not essential part of the practice of the religion of Islam and namaz(prayer) by Muslims can be offered anywhere, even in open” is followed immediately by the next sentence: “Accordingly, its acquisition is not prohibited by the provisions in the Constitution of India”. This, it said, “makes it amply clear that the above sentence was confined to the question of immunity from acquisition of a mosque which was canvassed before the Court. First sentence cannot be read divorced from the second sentence which immediately followed the first sentence.”Further justifying the observation, the court emphasised on the view that the observation was made in reference to the argument of the petitioners regarding immunity of mosque from acquisition. “The Court held that if the place where offering of namaz is a place of particular significance, acquisition of which may lead to the extinction of the right to practice of the religion, only in that condition the acquisition is not permissible and subject to this condition, the power of acquisition is available for a mosque like any other place of worship of any religion. Thus, observation made in paragraph 82 that mosque is not an essential part of the practice of the religion of Islam and namaz even in open can be made was made in reference to the argument of the petitioners regarding immunity of mosque from acquisition,” it explained. Furthermore, the Court rejected the contention advanced by the respondents that the principle of res judicata is attracted in the case at hand. It refused to accept the averment that the judgment of Ismail Faruqui should be treated as part of judgment in the suits before it, making reference to the High Court’s observations in the case. It noted that the impugned judgment had categorically held that issues, which have been raised in the suits, are not the issues which can be said to have been noticed and adjudicated upon by the Supreme Court in Ismail Faruqui’s case. It nevertheless concluded that the questionable observations made in Ismail Faruqui's case were made in context of land acquisition. These observations, it said, were neither relevant for deciding the suits nor relevant for deciding these appeals. “Whatever observations have been made in the judgment of Ismail Faruqui are not to govern the decision in suits and the suits were to be decided on the basis of the evidence on record. The questionable observations made in Ismail Faruqui's case have to be treated as only observations and not for the purpose of deciding suits and these appeals, they are not to be treated as governing factor or relevant. The said observations are to be understood solely as observation made in context of land acquisition and nothing more,” it opined.